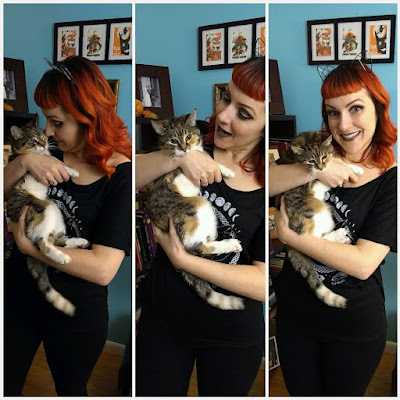 Fluffy The Vampire Slayer - Cats and Horror blog: 6 6 6 the Number of the Cat! 6 6 6 the Number of the Cat! I have some nerve combining the thought of angelic kittens with Satan but I'm not the first one to think fluffy cute kitties can be evil. Don't get me wrong I love, love, love cats but I did have an experience with an evil cat...once. I was cat sitting for a friend about 16 years ago. 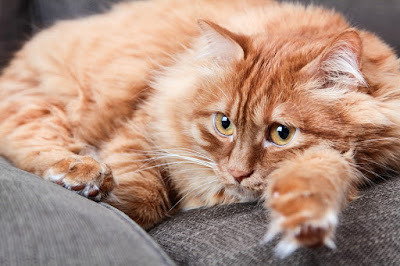 The cat was a long haired orange kitty named Joshua. (The kind you really want to pet because he's so fluffy). There was an introduction dinner to make sure he liked me, and in front of his owner Joshua was a gem! So shortly after, I stayed at my friend's apartment with her cat while she was out of town. She told me he was "shy" ~ I get shy cats. This cat was not shy, he was something else all together. As soon as my friend left, the cat disappeared under the bed. He had a strict diet and a mixture of pills I had to administer twice a day. Despite his unenthusiastic welcome, I was ready to care for this little guy! Note: Not an actual picture Joshua, but this could be his brother. The first couple days he only came out to eat. One of those days I had to wake up early and go to work. I was all dressed in a cute outfit, top, skirt, and tights. I put down his food and he crawled out from under the bed. Joshua took a leap at my calf with his claws, ripped my tights and latched on to my leg with his teeth! I had to kick him off. I grabbed the broom and shooed him away. I ran out into the hallway. He seemed possessed! Oh hell no, how can this adorable creature be terrorizing me? Ripped tights and two puncture wounds on my bloody leg, I knew I had to make a few phone calls. This was before I had a cell phone. I had to call into work and go to the doctor for a tetanus shot. I contacted my husband, Andrew ~ and him being the "cat whisperer" ~ he said, don't go back to the apartment, I'll feed him tonight so you don't have to. Then I called Joshua's owner. I explained what happened. She was supposed to be home the next evening, but rescheduled to come home earlier in the day. She didn't seem too surprised ~ that should have been a red flag. That evening Andrew went to feed Joshua, I went along and waited outside in the car. I was so nervous and it was taking too darn long. Just as I was about to go up to the apartment, Andrew came out. Joshua had bombarded him too! The cat ripped though his jeans in the exact same spot on his leg, leaving a wound. This cat was vicious. The next day owner came home and reimbursed us for our clothes and doctor bills, apologizing profusely. I should have known by all the Band-Aids and Neosporin in the bathroom that Joshua was not a tame cat, he was slightly demonic. Looking back on it, I think he was misunderstood, possibly feral, but she was determined to give him a loving home. Bless her heart. Evil cats need love too. It took me about a year to get over my fear of cats after this incident. Thank goodness I did, or I wouldn't have my very loving Vicktor and Ginger kitties. Flash forward to this Christmas. 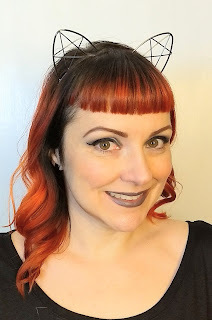 I didn't ask for much, just some new cat ear headbands, but my husband really delivered! So many companies have jumped on the cult cat clothing (say that three times fast) bandwagon and each one brings their own unique flavor to the table. 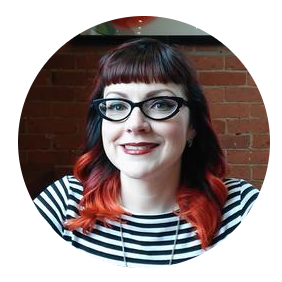 I'm going to list my top three, so you can let your playful wicked cat style strut. I'm not a name brand snob by any means, I just wear what I like (proof here) and I like things with cats on them. The first brand I ever saw with Satanic cat prints was Killstar. They have been around since 2010. I love the bell sleeves dresses, ruffles, and lace but many of them are impractical for layering in 3 degree weather. Everything would get bulky layered under a sweater, and knowing me, the long drapey sleeves would end up in my soup! 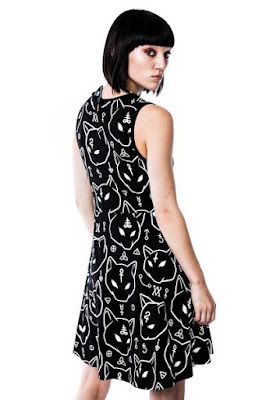 That being said, they do have nice going out and /or club clothes and incorporate classic gothic styles like a Wednesday Addams dress with original novelty prints, including cats. They don't seem to take themselves too seriously and that's what makes them fun. i.e. 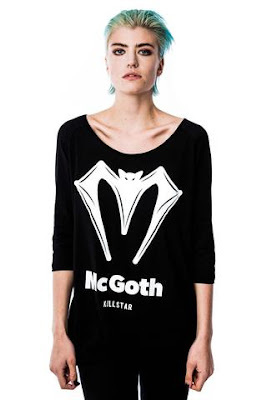 They have a McGoth line! 'Cmon that's pretty funny! 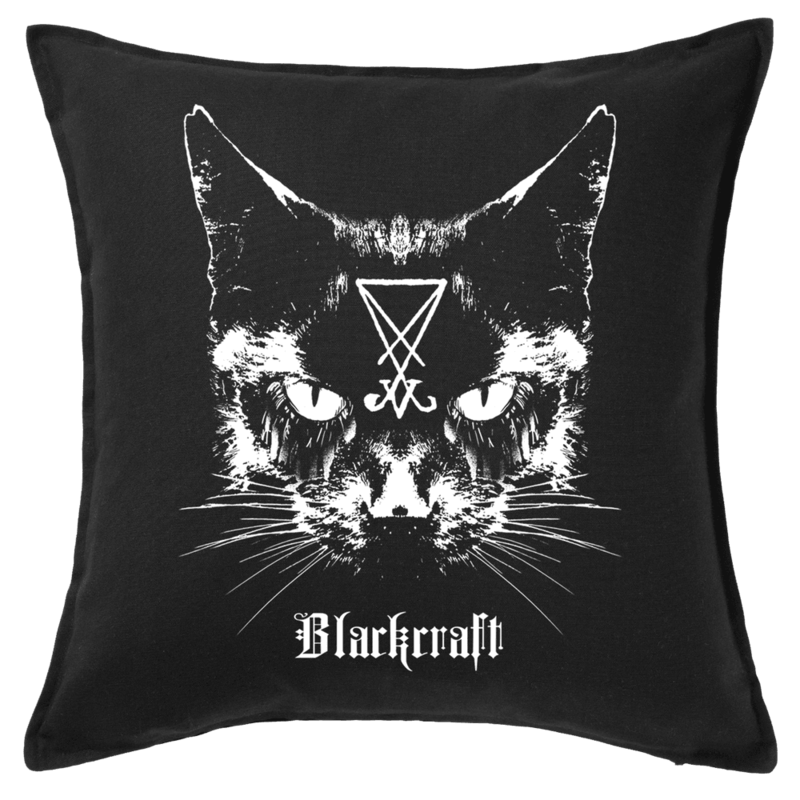 Unlike Killstar, BlackCraft Cult specializes in a more casual style. They offer printed T shirts for men and women, tanks, sweats, leggings, hoodies, and some accessories. 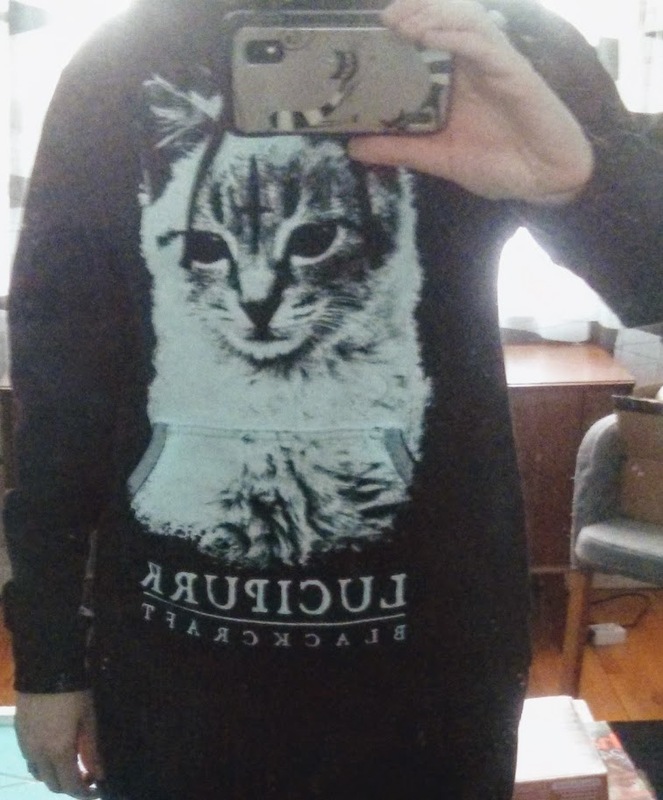 I was gifted this Lucipurr Hoodie and I couldn't be happier. It's toasty warm and the print is large, bright, and purrrfect. I may need to collect everything Lucipurr is printed on (and there's a lot)! Plus you can't go wrong with their philosophy, "To be kind to all man and animal kind, and do positive things for others." Just reading their "About Us" page makes me want to support such a admirable company. 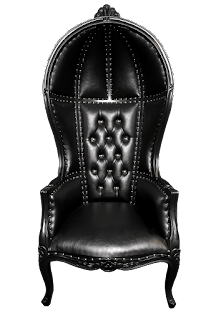 On a side note: they also sell gore-geous furniture and drinking spirits! Shown here: Me wearing my Lucipurr Hoodie, Lucifer the Cat Throw Pillow, Unholy Ritual Men's T, Hooded Balloon Chair, and BlackCraft Ghost Pepper Whiskey. 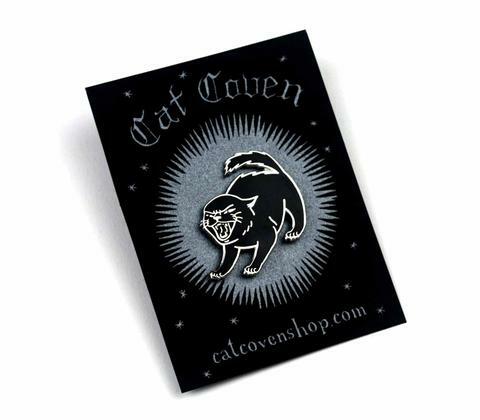 Cat Coven is the newest of the creepy cat brands I've been following. The shop began in 2013 and is a little more specific ~ they sell witchy cat print Ts, occult, and feminist Ts for men and women, along with banners and some small accessories. 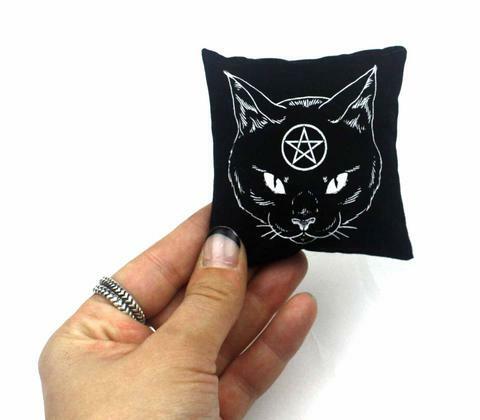 They even sell cat toys!!! How can you not love them?! I received a slouchy Magickal Protection T for Christmas. It's a little wider and looser than I'm used to, but I love the print and it's super soft, so I think it will be great for layering over dresses, doing yoga, over pencil skirts, I even like it with leggings. 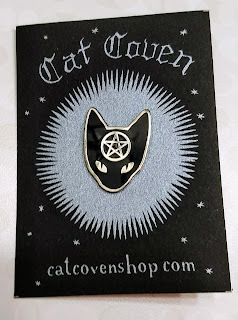 I was also was given a Cat Coven Pin ~ now I can feel like part of a real cat cult! They even donate portions of their designs to feminist causes. I can't wait to see what they design next! 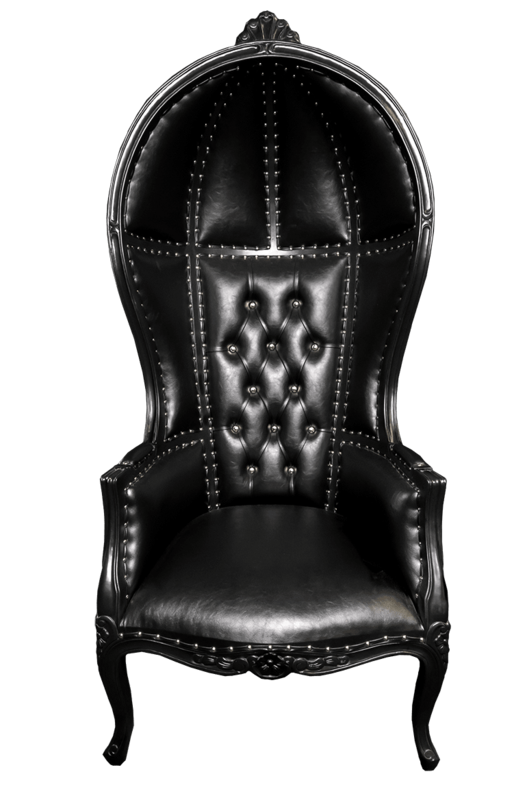 They are available here. 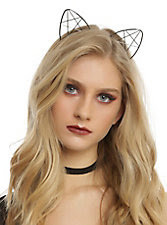 Their model looks so sad, you can't be sad wearing cat ears! I've decided to buy more cat ears from Hot Topic, the quality is surprisingly really nice for the price. Everytime I think of a demonic cat I will always think of Joshua, so get out there and dress like the demonic cat you are because all cats need love even the unholy ones. Meow. Bonus picture of the most angelic cat ever...my Ginger.